BU returns home for its second exhibition game, taking on the NTDP U18s in a 7:30 p.m. start at Agganis Arena. BU last played Team USA in October 2016, defeating the U18s, 8-2, behind Patrick Harper’s hat trick and two goals by Bobo Carpenter. A scheduled meeting last season was cancelled due to a storm. 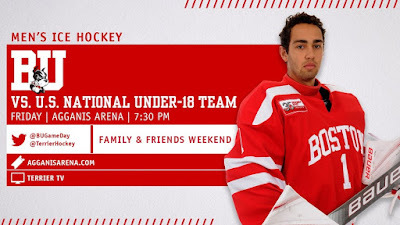 There may be as many as five future Terriers on the ice for Team USA as 2020 recruit Cade Webber, a defenseman for Shawn McEachern’s Rivers School team, has been added to the U18s roster for the weekend, joining 2019 recruits Domenic Fensore, Case McCarthy, Alex Vlasic—all blueliners—and center Trevor Zegras. In the U18s’s 6-3 win against Michigan last weekend, Zegras assisted on the first two goals and later scored the game-winner. 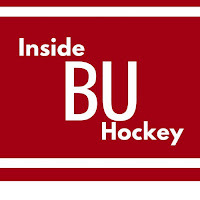 Coach Albie O'Connell told the Daily Free Press that junior defenseman Chad Krys, who has a lower-body injury, is unlikely to dress this weekend, adding that it's "nothing major," and that he "should be back soon." 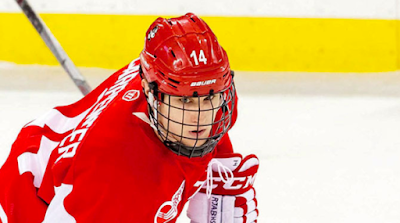 O'Connell on this year's U18s: "It might be the most skilled team we play all year." 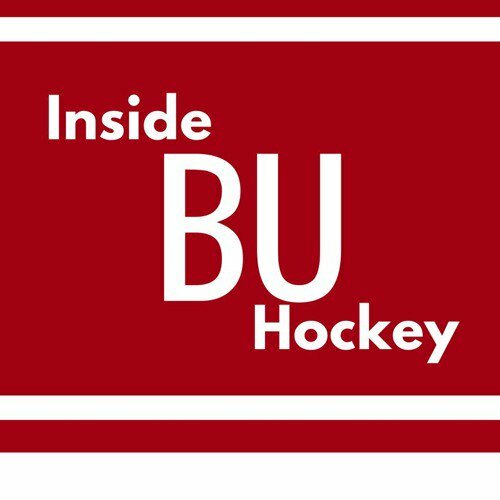 Episode 2 of Inside BU Hockey features Bernie Corbett’s interviews with Head Coach O’Connell, Associate Head Coach Paul Pearl and co-captain Carpenter. O’Connell was named the Terrier’s 12th coach this summer, succeeding David Quinn. Pearl joined the BU staff after four seasons as Harvard’s associate head coach and 19 years as head coach at Holy Cross. Carpenter, with 35 points and 20 goals as a junior, was a second team Hockey East All-Star. Senior Bobo Carpenter, along with junior Dante Fabbro will lead the Terriers this season as co-captains, with juniors Chad Krys and Jake Oettinger completing the leadership team as assistants. Carpenter tied Jordan Greenway for third in Hockey East overall scoring last season with 35 points and produced a team-high 20 goals. After his two goals last weekend against Minnesota State, he stands two goals away from joining BU’s 50 career goals club. Q. What were the keys to the team's success down the stretch last year and how do you hope to keep that momentum going into this season? A. Our team was able to keep our play very simple and hard, which helped limit serious mistakes that could hurt us during games. 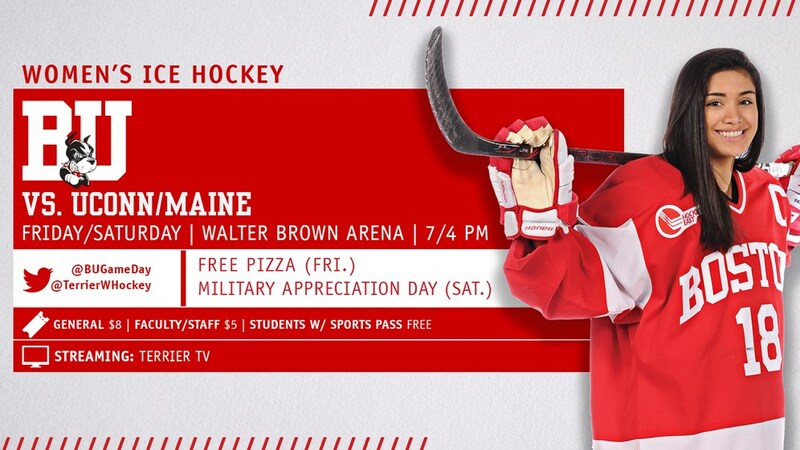 The best example of this was the Hockey East Championship against Providence. Our team could feel the energy we created throughout the game. Q. Game-to-game consistency is something coaches at any level strive for. How will you help Coach O’Connell achieve it? A. Communication. It’s the key factor between players and coaches. With this the coaches can make decisions aiding players on and off the ice to best prepare the team as a whole when it’s time to compete on the weekends. ► SBNation’s Chris Dilks looks at the performances last weekend of the top NHL prospects from BU and Minnesota State. Clayton Keller scored his first goal on a steal and breakaway as Arizona defeated Chicago, 4-1. Charlie McAvoy and Matt Grzelcyk each assisted on a goal, but the Bruins dropped a 3-2 overtime decision to Edmonton. Danny O’Regan scored his second goal as AHL Rochester defeated Utica, 6-1. Terriers begin a weekend pair of Hockey East games tonight, hosting UConn at Walter Brown Arena with puck drop set for 7 p.m. Four games into the season, BU’s offense is led by sophomore Jesse Compher (2-3-5), red-shirt junior Sammy Davis (3-1-4) and freshman Courtney Correia (0-3-3). Sophomore Corrine Schroeder has made three of four starts in goal.